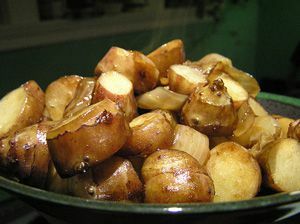 This roasted sunchokes recipe is as versatile as it gets; make them into an easy side dish, fresh from the oven, or toss them with a variety of dressings for a cold salad. Sunchokes, also known as Jerusalem artichokes, are slightly sweet and have a faintly nutty scent. They are native to the eastern United States and have recently popped up on menus at French restaurants. Preheat the oven to 400. Toss the chopped sunchokes with the olive oil, salt, and pepper. Arrange the seasoned sunchokes in a single layer on a baking sheet or shallow roasting pan. Roast the sunchokes for 40 minutes, until they have turned golden brown. Serve the sunchokes hot from the oven or toss with dressing and serve them cold as a salad.